Check out today's article on DIY craft in the Washington Times HERE. More soon, catching up from vacation! I will be on a panel at Dwell On Design in late June in Los Angeles with my friend Billie the co-owner of Reform school. I'm on a trip out west that isn't work related which is a little over due. 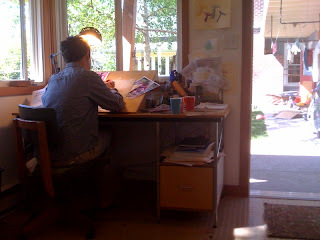 Today I'm in Olympia with my friend Ira and we ended up over at Nikki McClure's studio where Ira was doing some painting. I got to catch up with Nikki as she worked on her new book. 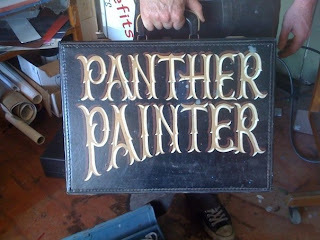 Ira is a sign painter, this is a case he lettered awhile back with his business name on it. Tuesday I am doing a private screening at Hallmark in Kansas City, MO which should be a cool experience. 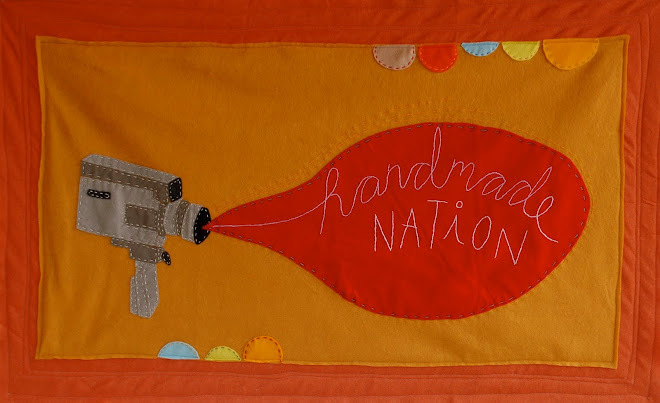 Thursday Handmade Nation premieres in Denver, CO for one night only! Sponsored by Fancy Tiger, information HERE. Sewing Made Seriously Simple: a book review! When I was learning how to sew, my mother was always my resource for answering the technical questions of dressmaking: What is my size exactly? How do I put in a zipper? She walked me through seam finishing and attaching buttons, creating gathers and making dress details with lace and so much more. I would recommend her as a sewing instructor to anyone, but if the chances of you all making it to Portage, Wisconsin to hang around her farm for a few lessons seems a little far-fetched, I would recommend buying the book Chic & Simple Sewing instead. If you have always wanted to learn to sew your own clothes, this is the perfect place to start. It is fun, informative and incredibly easy to follow. As long as you have the time to learn, I think that this book will create many successful sewing ventures that only my mother could walk me through years ago. Check out their website for additional information on how to register early and get a discount. Also check out information about scolarships and featured speakers, including our friend Rob Walker writer for the "consumed" section of the NY Times Magazine and author of "Buying In: The Secret Dialogue Between What We Buy and Who We Are". I am having an amazing time in Phoenix, there is so much amazing stuff going on here in this city. Off to brunch with my hosts and the Crafty Chica herself, Kathy Cano Murillo. One more screening today at Modified Arts, hopefully it will sell out like yesterdays showing. I got a great review you can read HERE from yesterday too! And, if you have a spare moment read this article that was passed onto me about the growing movement of younger foodies in Brooklyn, there is so much crossover with what is going on with DIY creativity in this article HERE. Pictures and more news to come! I fly home right after my screening and will be in Milwaukee all week catching up on stuff.... Oh and don't forget to do read about the giveaway that P.A. Press is doing for the book below! I know the economy has got us all down, but far from out. 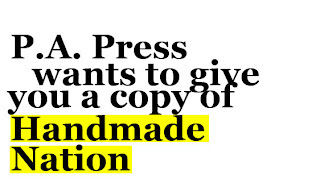 We here at Princeton Architectural Press said to ourselves, "what better time then now to give away a copy of Handmade Nation: The Rise of DIY, Art, Craft, and Design?" So we came up with crafty little facebook friend drive, and decided whoever puts the most elbow grease into inviting their friends to check out (and hopefully add!) 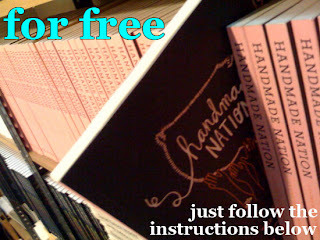 Handmade Nation on facebook will get a free copy of this beautiful book by the multi-talented Faythe Levine and Cortney Heimerl. Most of you will not need convincing if you have seen the documentary or already read the book, but for those of you who are new feel free to check out a sample chapter we put up at this link http://issuu.com/papress/docs/9781568987873 Here you can see all the beautiful work of Jill Bliss, Nikki McClure, Clarity Miller, Stephanie Syjuco, and Sarah RaRa. This is a simple little contest to see who can suggest this page to the most friends. Once you suggest this page to friends simply email me, Andy Stepanian at epublish@papress.com and tell me how many people you suggested this page to, at the end of the week I will tally up the emails from you all, read the online stats, and email the winner back to get an address to send the book to. Perhaps I'll even throw in a few surprises. 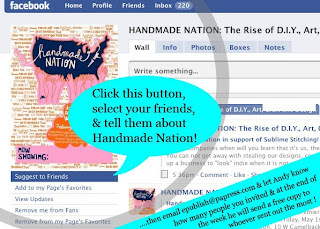 Good luck and thanks for supporting Cortney, Faythe, and Handmade Nation! 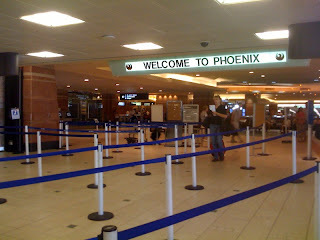 Up at 5am today to catch my flight to Phoenix where it is a whopping 90 degrees outside! 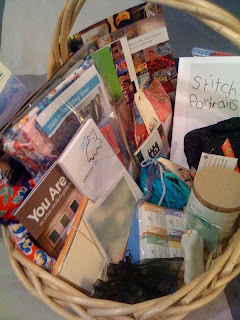 I arrived at Cindy's house where I am staying for the weekend and the Phoenix craft community put together this awesome basket full of local goodies for me. So super sweet! I'll be at Frances tonight from 6-9pm for a booksigning if you want to come find me!